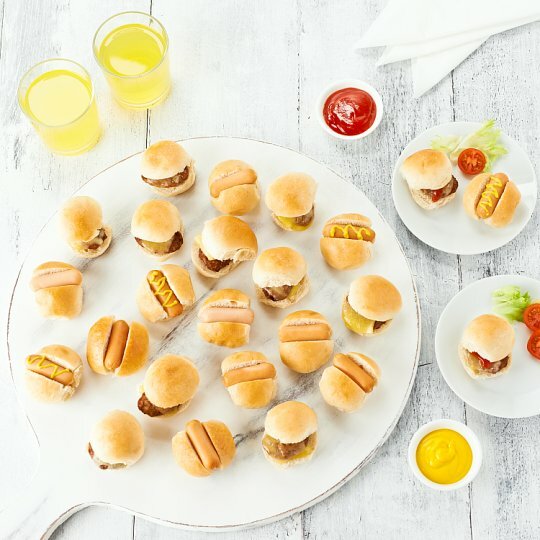 12 Mini bread rolls filled with beef burgers and Cheddar cheese. 12 Mini bread rolls filled with frankfurter sausages. Sachets of tomato ketchup and mustard. Wheat Flour (Wheat Flour, Calcium Carbonate, Iron, Niacin, Thiamin), British Beef (22%), Water, Mature Cheddar Cheese (Milk) (13%), Onion, Pasteurised Egg, Sugar, Salt, Rapeseed Oil, Yeast, Dextrose, Tomato Purée, Black Pepper, Onion Powder, Flour Treatment Agent (Ascorbic Acid), Garlic Powder. Wheat Flour (Wheat Flour, Calcium Carbonate, Iron, Niacin, Thiamin), Pork (29%), Water, Potato Starch, Pasteurised Egg, Salt, Sugar, Rapeseed Oil, Yeast, Potato Fibre, Spices, Stabilisers (Disodium Diphosphate, Sodium Triphosphate), Dextrose, Flour Treatment Agent (Ascorbic Acid), Antioxidants (Sodium Ascorbate, Ascorbic Acid), Preservative (Sodium Nitrite). Water, Sugar, Tomato Paste, Spirit Vinegar, Cornflour, Salt, White Pepper. Water, Spirit Vinegar, Mustard Flour, Cornflour, Mustard Bran, Turmeric, Salt, Concentrated Lemon Juice. Instructions: For best results reheat one pack at a time. Remove sachets of ketchup and mustard. 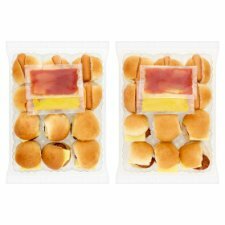 Place hotdogs and burgers on a microwaveable plate. Heat on full power for 1 minute 30 seconds (800W)/ 1 minute (900W). Serve with the tomato ketchup and mustard provided. 12 Mini bread rolls filled with frankfurter sausages. INGREDIENTS: Wheat Flour (Wheat Flour, Calcium Carbonate, Iron, Niacin, Thiamin), Pork (29%), Water, Potato Starch, Pasteurised Egg, Salt, Sugar, Rapeseed Oil, Yeast, Potato Fibre, Spices, Stabilisers (Disodium Diphosphate, Sodium Triphosphate), Dextrose, Flour Treatment Agent (Ascorbic Acid), Antioxidants (Sodium Ascorbate, Ascorbic Acid), Preservative (Sodium Nitrite). 12 Mini bread rolls filled with beef burgers and Cheddar cheese. INGREDIENTS: Wheat Flour (Wheat Flour, Calcium Carbonate, Iron, Niacin, Thiamin), British Beef (22%), Water, Mature Cheddar Cheese (Milk) (13%), Onion, Pasteurised Egg, Sugar, Salt, Rapeseed Oil, Yeast, Dextrose, Tomato Purée, Black Pepper, Onion Powder, Flour Treatment Agent (Ascorbic Acid), Garlic Powder.